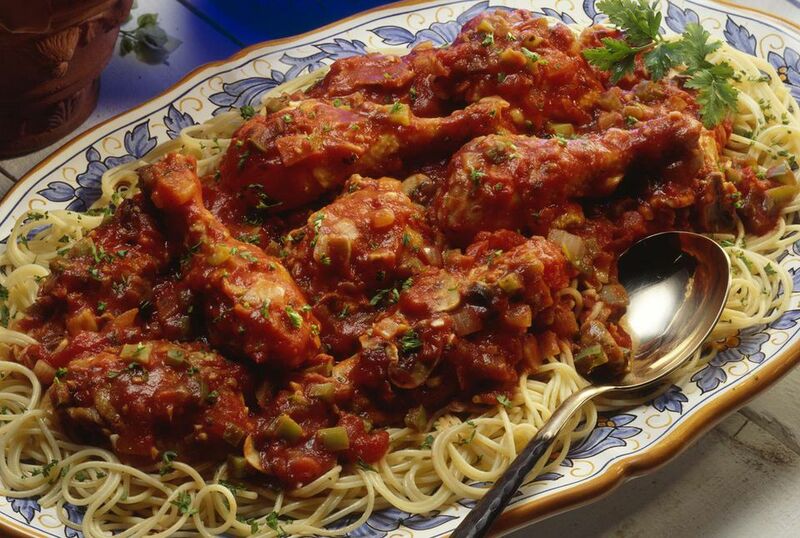 Serve this easy chicken cacciatore with spaghetti, linguine, or similar pasta. It's good with bow tie pasta (farfalle) as well. Add a broccoli salad or simple green salad and crusty garlic bread for a fabulous family meal. The cacciatore can be made with chicken parts or use all chicken thighs or whole legs. Boneless chicken breasts cook more quickly, so keep them warm after browning and add them to the tomato sauce about halfway through the cooking time. Heat olive oil over medium heat in a large skillet. Brown chicken on all sides in hot oil, about 10 minutes. Remove chicken and drain off excess grease, leaving a tablespoon or two. Add chopped onion, green pepper, and minced garlic to hot skillet; sauté until onion is tender. Stir in tomatoes, wine, oregano, salt, pepper, and bay leaf. Add chicken back to sauce and bring to a boil. Reduce heat, cover, and simmer for about 45 minutes, or until chicken is tender. Discard the bay leaf and serve with hot cooked spaghetti or other pasta. For a spicier sauce, add about 1/2 teaspoon of crushed red pepper flakes. You might also like this similar recipe for slow cooker chicken cacciatore or this chicken oregano with garlic and tomatoes.